Experience the life of an Indian maharajah whilst soaking up the romantic sights of Rajasthan. Blending the best of Indian culture with unashamedly opulent hotels, this luxury Rajasthan tour is a winning combination for the ultimate in Indian indulgence. 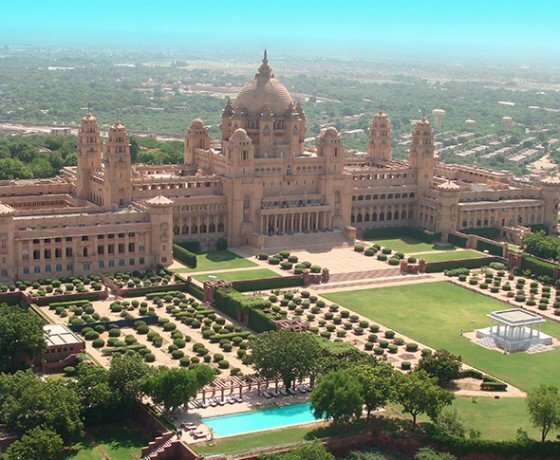 In celebration of the Taj Umaid Bhawan Palace being voted as the ‘Best Hotel in the World’ in 2016 by TripAdvisor, Indian Excursions have collaborated with Taj Hotels to offer the ultimate luxury Indian holiday experience, staying in some of the country’s most legendary palace hotels. Former royal residences, these magical properties evoke all the pomp and grandeur of yesteryear. However, our Luxury Rajasthan Tour with Taj Hotels is merely a starting point to share a flavour of the possibilities; we can make any number of adjustments until we’ve tailor-made your ideal journey. Upon your arrival in Delhi, you’ll be met by a member of our team at the airport and chauffeured to the Taj Palace Hotel for a two night stay. Take it easy for the rest of the afternoon to relax and recuperate from your international journey (though your chauffeur is always on hand if you’d like to begin exploring). Situated in the capital’s affluent embassy area and surrounded by acres of manicured gardens, the Taj Palace is an ideal base for exploring the sights of Delhi. Rooms and suites are palatial, elegant and tastefully furnished. The hotel prides itself on excellent service and wide range of amenities; including a swimming pool, putting green, and spa. After breakfast, you’ll be met by one of our passionate and knowledgeable guides to explore the contrasts of both Old and New Delhi. Sights to see include the Jama Masjid, Qutab Minar, India Gate, Parliament House, Humayun’s Tomb and the Sikh temple. The itinerary we’ve prepared in advance is a guideline and is completely flexible to your preferences on the day: you may let your guide know your interests and he will tailor the day’s sightseeing to you (we’re known for our flexible approach, allowing you complete control over the pace of your trip). After exploring the capital you’ll return to the Taj Mahal Palace hotel for the evening, though your chauffeur is always on hand if you’d like to dine out. This morning you’ll proceed to Agra – home of the magnificent Taj Mahal – for an overnight stay at the Taj Gateway Hotel. After having had chance to freshen up over lunch, you’ll be met by your guide to explore Agra Fort, followed by the Taj Mahal in its most beautiful light – glowing a warm orange at sunset. Back at the Taj Gateway Hotel this evening, your Executive Suite affords a wonderful view of the monument from your very own window. Without the restriction of visiting hours, you can catch the Taj Mahal glittering in the moonlight after dark or a peachy pink at dawn. This morning, there’s an optional sunrise visit to the Taj Mahal if you’d like to return to the monument – otherwise, why not enjoy the view from the comfort and privacy of your Executive Suite? Later that morning, you’ll be chauffeur onwards to Jaipur, stopping in Fatehpur Sikri on the way to explore Emperor Akbar’s 16th Mughal walled city (it was abandoned after just 14 years). Upon arriving into Jaipur later today, you’ll be assisted with checking in to the iconic Taj Rambagh Palace for a two night stay. A former royal residence, this fairy-tale like palace is impossibly romantic; from the Indian musicians playing on cool verandas, to the colourful peacocks strutting across the 47 acres of beautifully landscaped gardens. Affectionately referred to as the Jewel of Jaipur, the palace boasts some of Rajasthan’s finest rooms and suites, two restaurants, the delightful Polo Bar, and an art-deco style swimming pool. Tucked away in a quiet corner of the gardens is the Jiva Spa tent. If you can tear yourself away from the Taj Rambagh Palace this morning, your guide awaits you for a full day of sightseeing in the Pink City. To begin, you’ll climb the 16th century Amber Fort by elephant, before exploring the splendid palaces that lie within the complex. This afternoon you’ll continue onwards to the City Palace Museum, Jantar Mantar observatory and famed Hawa Mahal (Palace of Winds). You’ll end the day with a guided walking tour through the colourful markets at Badi Chauper bazaar; Jaipur is well known for its beautiful local handicrafts, vibrant textiles and semi-precious jewellery. This evening, there is the option to learn the secrets of Rajasthani cuisine on a private cooking class with Divya Singh – a unique experience. 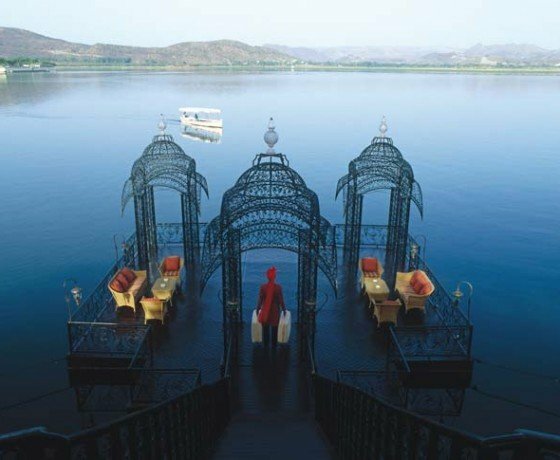 Alternatively, spend the evening at your leisure enjoying the Taj Rambagh Palace. 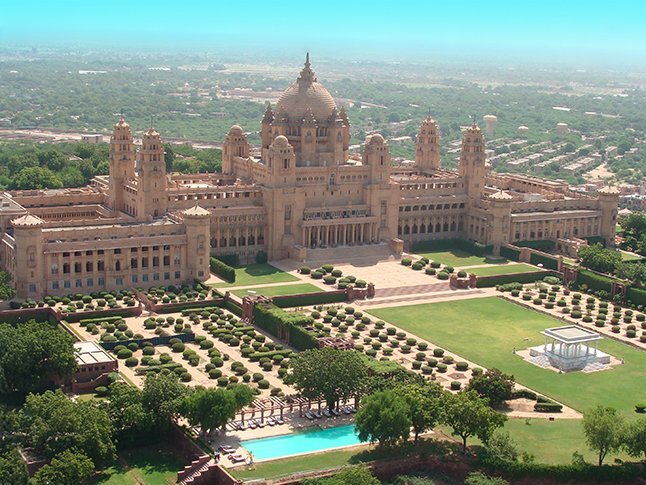 Continue to Jodhpur on a scenic drive through the Aravalli hills, for a two night stay at the spectacular Taj Umaid Bhawan Palace. Recently voted by TripAdvisor as the World’s Best Hotel 2016, the Taj Umaid Bhawan Palace is opulent enough to make even the most discerning of guests nod their approval. Fit for a king, the Maharaja of Jodhpur himself still lives here at the palace and can often be seen walking his dogs on the vast grounds. This evening, enjoy a guided walking through the palace, followed by a glass of sparkling wine at the bar, pretending you’ve stepped back in time. 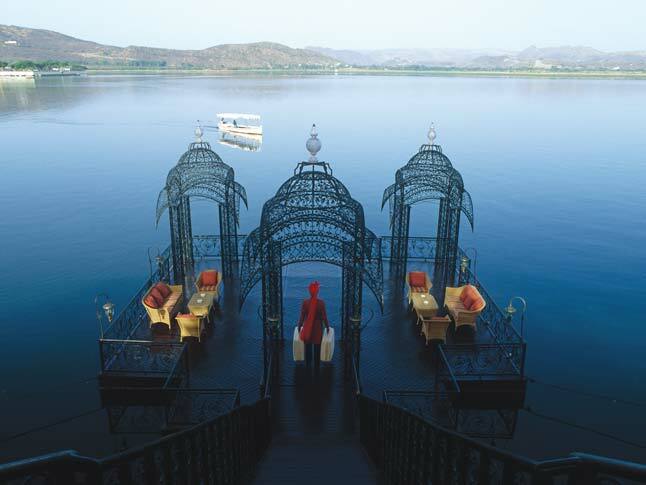 This morning you’ll continue to the fairy-tale like city of Udaipur. On the way, break your journey in Ranakpur, to explore one of India’s most elaborately carved temples. 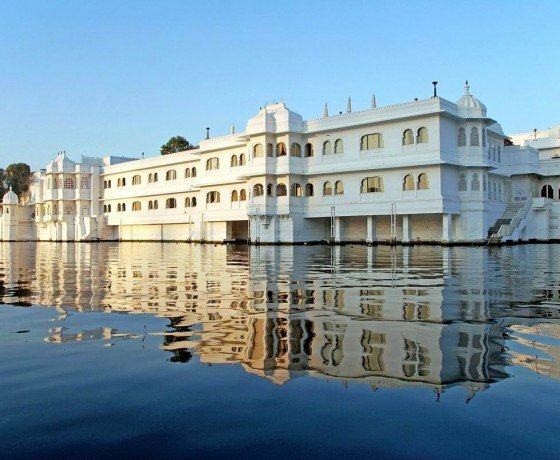 Upon arriving into the lake city later today, you’ll take a short boat-ride over Lake Pichola to reach the iconic Taj Lake Palace. 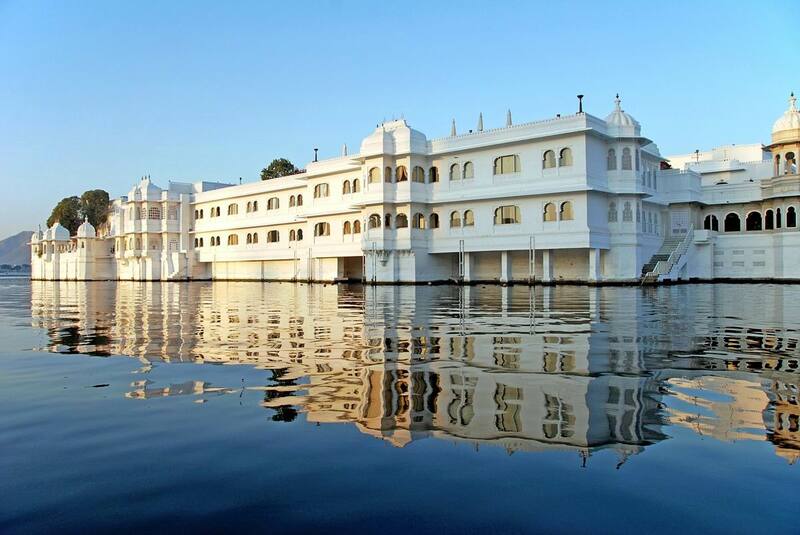 Originally built in the 17th century as a summer retreat, and accessed by a short boat ride from the shore, this dazzling 250 year old white marble palace appears to float like a mirage in the middle of Lake Pichola. Today you’ll be accompanied by your guide to explore the city of Udaipur. To begin, a walking tour through the narrow streets of the old city will take you through winding streets teeming with shops selling clothing, silver jewellery, and leather-bound journals. You’ll shortly approach the City Palace – this sprawling palace is the largest in Rajasthan and stands on a ridge overlooking the lake. Cupolas crown its octagonal towers, which are connected by a maze of narrow passageways. The rooms inside the City Palace all contain decorative art: beautiful paintings, colourful enamel, inlay glass-work, and antique furniture. You’ll also explore the 17th century Jagdish temple and Saheliyon-ki-Bari (a beautiful rose garden). Other sights you may like to cover include the Monsoon Palace, the Vintage Car Museum, and a boat-ride out to the Jag Mandir Island Palace. The morning is at your leisure today, to relax and enjoy the palace or explore the easy-going town of Udaipur further at your own pace. This afternoon, you’ll be chauffeured to Udaipur airport to board a flight down to Mumbai. You’ll spend your last two nights in India at the Taj Mahal Palace – one of India’s most famous luxury hotels. Built in 1903, this iconic hotel is centrally located on the waterfront, nestled in front of the Gateway of India and overlooking the Arabian Sea; the views of and around the hotel are fabulous. During your stay you can indulge in a number of excellent restaurants and bars, and a choice of designer shops. Taking the launch from the Gateway of India, a guided tour of bustling Bombay will today begin at the 8th century Elephanta caves, home to an 18-foot statue of Lord Shiva. Continue into the afternoon to explore colonial gems such as Victoria Terminus, Flora Fountain, Horniman Circle and the High Court. Pass through the Hanging Gardens and the Jain Temple to end your day at Chowpatty Beach; or, take in the buzz and excitement of Chor Bazaar. Today you’ll be chauffeured back to Mumbai airport in time for your onward flight. If your flight is departing in the evening, your chauffeur is always on hand if you’d like to do a bit of shopping or explore the sights further. Our journeys are inclusive of accommodation with breakfast, a private car with driver throughout, experienced guides, internal flights, entrance tickets and excursions. In other words, we offer a seamless and hassle-free experience where the only thing you need to worry about is soaking up the sights and enjoying your fabulous Taj hotels! This indicative cost is based on a couple travelling between October 2018 and March 2019, sharing a double or twin room. The cost would reduce significantly during the low-season months of April to September, whilst it would be noticeably higher during the peak Christmas and New Year period. Our Luxury Rajasthan Tour with Taj Hotels can be tweaked or completely redesigned to perfectly suit your tastes, schedule and requirements. The itinerary suggested here is merely a starting point. 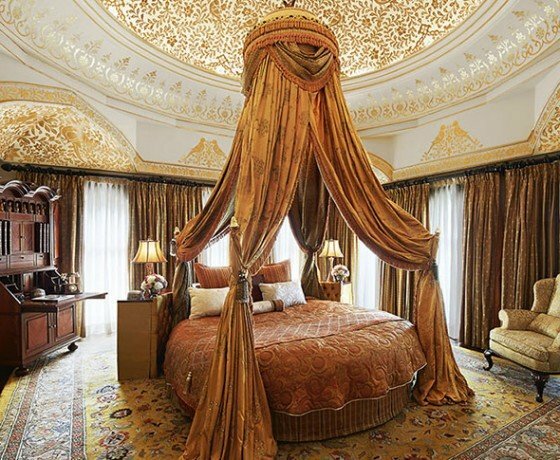 For example, you may like to stay at the luxurious Oberoi Amarvilas in Agra, rather than the Taj. 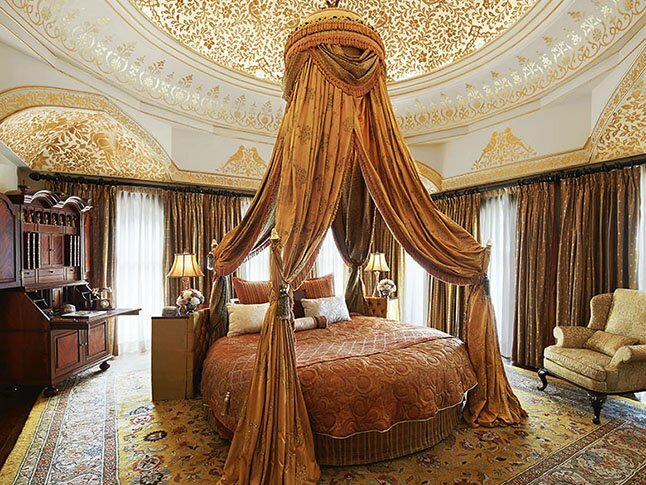 Or, you might like to extend your palace experience with a stay at the Taj Falaknuma Palace in Hyderabad. The possibilities are endless.